We are very excited to announce the debut Aphotic Audio compilation album, Surge & Subside: Queensland Flood Appeal. It was an honor for Streak to be a part of this incredible collection of music for such a good cause. 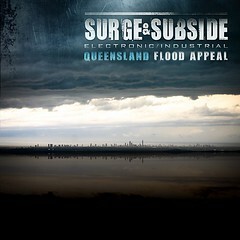 Surge & Subside is an Electronic/Industrial FUNDRAISER compilation for the flood victims in Queensland, Australia. Featuring over 40 tracks from artists all around the globe and over 200 minutes of the best collection of electronic and industrial music today. Also, make sure to check out the rest of the site for info and interviews on other awesome MA bands!! Fabryka [www.IndustrialRock.net] reviews “Break Away” !! 03.03.2009 by chris in - News, - Press / Media / Podcasts | Comments Off on Fabryka [www.IndustrialRock.net] reviews “Break Away” !! I would like to thank our new friends over at Power Forge Radio for featuring STREAK on the latest episode! Check out the link below to listen to not only “Breathe” & “Break Away”, but also a great mix of other music from a whole bunch of great artists.